Should I Rent or Buy a Portable Modular Classroom in Texas? What are the options for Portable Modular Classrooms in Texas? This is the most common question I answer for schools, daycare centers and churches across the U.S.... and Texas is no exception! First of all, a "Modular Classroom" is the same thing as a "Portable Classroom" in the U.S. While the sizes and configurations may change from supplier to supplier the names refer to the same type of structure. People in Texas have called me using words like portable, modular, temporary, even classroom trailer to describe their needs. * To get actual price quotes from suppliers in Texas use this Texas Modular Classroom Price Quote form. Depending upon the finances you have to work with and the nature of your space need (short term, long term), one of these options should be a good fit. For example, if you are in need of multiple 24' x 40' portable classrooms for less than two years it probably makes good financial sense to lease the units. On the other hand, if you need a more permanent long term modular building - a daycare center for example, it probably makes sense to negotiate an affordable sales price and buy the structure outright. This option will save you from paying far more than the building is worth in the long run. 1. How long do you need to use the modular classroom? Long term = lower lease rate and more negotiating power. Short term is less desirable to the supplier so the prices increase considerably. 2. Do you prefer a new modular classroom or used? Used modular classrooms will save you time and money because there are more of them readily available. New modular buildings offer more design flexibility but will typically take longer to be manufactured and cost more to purchase or lease. 3. When do you need to occupy the modular classroom? During the high season when demand is up and supply is down prices to rent or buy typically increase. In Texas spring and summer are the high seasons in the modular classroom market. Keep in mind that delivery, installation, knock down and return delivery are additional costs that can be negotiated as one time payments or amortized into the lease rate if need be. I hope this article helps anyone in Houston, Dallas, Austin or other parts of Texas and the U.S. save some time and money. Feel free to call me if you need any help! The tips I point out in this post also apply to modular building and mobile office trailer rental and purchase. 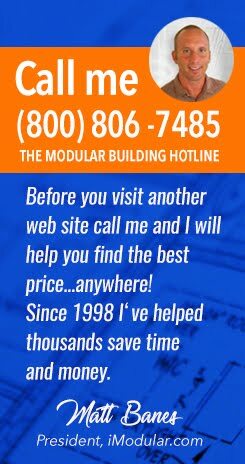 Buying a used modular building is still one of the best options in Texas and anywhere in the U.S. if rent/lease is not an option.